So, lately, we've been talking a lot about where we want to raise Sam and what this neighbourhood/city/province looks like. Both hubby and I grew up in suburbian Ontario, home to the $139,000 4 bedroom family home and we have since moved many, many times, only to end up in "big-city" Vancouver, home to the $650,000 bachelor condo. The thing is, we absolutely love our life in Vancouver - the weather, the mountains and oceans, the laid-back lifestyle. Growing up in Eastern Canada, Vancouver seemed like worlds away, and I'm kind of jealous that Sam got to be born in such a cool city (as opposed to Sherbrooke, Quebec). Our problem lies in the fact that we currently rent a 2 bedroom condo in a somewhat inner-city neighbourhood. If we ever want to own a home, or even rent a larger apartment, or feel safe to have Sam ride his bike down the block, we either need to leave the city and move to the suburbs or, leave the city to somewhere else in BC, or gawd! Eastern Ontario (I can't believe I've even just written this). Do I want Sam growing up in the city, going to the art gallery, museum, riding the transit system or do I want a large yard for him to run around him, with perhaps some woods to run through and trees to climb? And, most importantly, am I willing to give up my new life in Vancouver and move, if after all this thinking, I realize that we need to leave Vancouver in order to give Sam the childhood he deserves? These are my babbles and I'd love to see if this resonates with any one of you mamas out there? How do you juggle your sense of place with where you want to raise your child vs where you can afford to raise them? I hear you. I went through similar thoughts when it came time to go back to work – more money, or more time watching my kid grow? In part it’s about the same financial “freedom”. Does a bigger yard bring more happiness? I don’t know. When I read about the suburbs and the great sense of isolation that people feel there, together with the added stress of longer commutes that contribute to road rage as well as less time with family – the picture is far from idyllic. One of the things that I loved most about moving out here (also from Ontario) was how easy it was to escape it all. With public transit and a bike I managed to find myself in a variety of forests, hikes and camping adventures that were only available in Ont.with the use of a car (which I’m allergic to, on several levels). I also love the people here. There are just more like-minded folks. Kind, open-minded folks surrounded by breathtaking beauty – that is where I want to raise my kid. Hmm. Well, we decided to live in a first-generation suburb that's near a big (U.S.) city. Our yard isn't huge, but it does exist. And the museums, art galleries, etc. are just a 20-minute car or train ride away. In a lot of ways, I think we have the best of both worlds. We make compromises--everyone does--but we've found a solution that works for us. Hope you can do the same. everything you wrote in your post is why we moved away from Commercial Drive to Nelson, BC. I loved my life in Vancouver & was really scared to leave it - but also really wanted to own a home, which would never be a reality for us in Vancouver. I also wanted to work less so i had more time so spend with Nile, and living in Vancouver that just was not an option. The move was challenging in some ways, but moves always are, and i can honestly say that we are really happy here. it was pretty easy to make new friends (i find that having a child makes that easier somehow), we own a home (finally!) and there's lots of other Vancouver transplants living here, too, which is nice. It seems like most of the young families that live here have moved from either Calgary or Vancouver..for many of the same reasons as you are contemplating. Before you leave BC, consider exploring some of the smaller, progressive communities in the province. Living in a smaller community is really nice. I find that we have everything we need - affordable housing, beautiful mountains, a natural food store, friendly people, an amazing Waldorf school (and IKEA is only 8 hours away if i'm really in a pinch). I still absolutely love Vancouver and try to visit often - now going to the big city is a family adventure that we all enjoy & look forward to. ps - You're more than welcome to come & visit us if you guys want to check out Nelson! Totally hear you about our kids growing up with the safe bike-riding down the street but I think in general this is a different world than when we grew up. 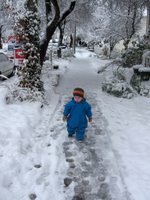 Its not just East Van that parents walk their kids to school but all over Canada now. But heck, we use sunscreen on our kids now too. And while I generally speaking love our leftie neighborhood and other families, Rian and I were at the park on Sunday and a 2-year old girl pushing him twice and the hippie mom said nothing to her! He even got pushed into a puddle (making me wash the handmade jacket with the fish) and was crying but still the mom said nothing! But saying all that, I'm totally into property ownership! I liked Doppleganger's approach to buy land on an island close to Vancouver and over time work to build something on it. And someone mentioned the Sunshine Coast which is going up about 16% a year... that's not to say you need to live there but is there a way of renting a place out or doing summer rentals, etc. that would cover your mortgage costs etc? Even in East Van, we had to rent out our crappy 6' ft-tall- ceiling basement- student- suite over the weekend and we got 38 responses, 18 viewings at the open house and 13 people wanted it! Its a crazy rental market. It, sadly, came down to a personality contest and I had to email the other applicants like I was turning them down for a job - it was awful! So I'm sure if you bought an investment condo, even at a 100% mortgage you could break even and be on the property ladder! Talk to me! ... saying all that, we now have a real estate agent on Sunshine Coast as we're already looking at land... I love property! Anyway, I don't think I'll ever easily leave the East Van life - Toronto is a great place for Rian to visit as he grows up up but I'd much prefer him to be friends with the hippy-families than with the more mainstream, conservative and isolating (or worse) influences that exist elsewhere. So I don't know - I'm not any of you would thrive if you moved back to the Ontario burbs but there may be other more local options to consider. You guys seems to be in a state of flux with N's new job and your recent change of career - yet you also want Sam to have as much time with his parents as possible (and somehow you've made it work!!). Maybe we need another Mommies night out soon?!? Sorry to chime in on this one so late...! 3. What works this year may not work next year, so it helps to keep an open mind. Having grown up living in a blend of inner-city and small town, I can honestly say that what made my childhood a happy one was to be surrounded by good friends and my mom, and to feel as though I could be anything I wanted to be. Basically, I think it is great that you & Neil are continuing to hash this out and figure out your next steps. Good luck! PS - count me in for a mom night! I'll try to keep this short... I can ramble with the best of them! I totally empathize with your situation. I am the mother of three great kids - all under the age of five - living in Philadelphia, PA. I hail from the country and was excited to make the move to Philly. There are so many great things about raising kids in the city - those things you mentioned like art, culture and proximity to great friends and neighbors. Every now and again, I get the "bug" to move in search more yard to play in, cheaper housing stock, no private school tuition... But ultimately, I have decided to remain in Philly. I think it's easy to think that the grass is greener on the other side... And for some maybe it is. But I think it's really person-specific. My college roommate was born to be in the suburbs; she loves everything about it. Another friend moved and was bored out of her mind - in an attempt to blend in, she changed who she was and ultimately lost her identity and her husband. I know it's a struggle to figure it out. I regularly find myself thinking about it. But I think it's important to consider what it really is that you're planning. I was reminded by my husband that there's nothing wrong with running TO something, but you should never run away from something - you never know what you're going to get. Hey True the gold coast is great. Had a great time there plenty to do.